The quickest and easiest way to find what you are looking for is to use the Search Feature that is present throughout the site. There is a QuickSearch box on most pages, just type in what product you are looking for and press the return key or the Go! button and it will take you to a page that displayed any relevant results. For best results search for a brand name (Pegasus, Bette, Impey etc.) 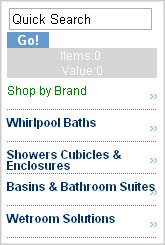 or by the product name or type(Helena Whirlpool Bath, Bette Ocean, Whirlpool Kit, etc.) or even search by dimensions (eg. 1700x800) or anything specific to the product, or type of product. Or for a more advanced search click Search at the very top, right-hand corner of the page. Using this Advanced Search you can also search by Price or limit the results to a specific section. The advanced search page lets you make a more comprehensive search. You can search on keywords as you would on any other search engine. If for any reason you can not find what you are looking for, feel free to give us a call on 0845 130 2000 or email sales@weuk.co.uk and one of our sales team will get back to you as soon as is possible.